Firstly, just wanted to say a quick thanks to everyone who’s wished my happy birthday! I had a lovely day and the was spoilt rotten on the evening at SIX. I’ll share a full review soon but I just wanted to quickly share links to this: the latest treat to be issued from Vogue’s offices..
Offering a further insight into the goings on in Vogue’s offices and following its editors, In Vogues: The Editor’s Eye, takes us back into the world of Anna Wintour and Grace Coddington. And I’m sure will be just as interesting as its predecessor, The September Issue. 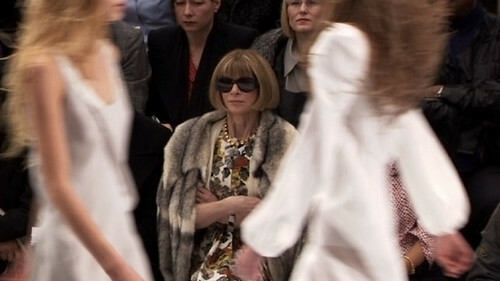 Nothing fascinates me more about fashion than hearing the insider stories. Yes, I love the clothes and the glamour of the fashion industry, but I also admire the craftsmanship and the intense labour which comes from behind the scenes. Which I guess is why I’m fascinated documentaries like Signe Chanel which offered a glimpse of the Chanel seamstresses, or watch Grace Coddington argue the toss with Anna Wintour on The September Issue. There’s something slightly voyeuristic about being able see ‘behind the scenes’, but it’s also brilliant to be able to see how many people’s hard work is behind the industry. Like a lot of the creative industry, it’s a funnel effect where a huge amount of work may go into something that’s end result seems very small. And sometimes the journey is just as important as the final product. At the launch event for Shift one of our guest speakers, Dan Rose touched on something similar to this. Working for bespoke furniture company, Raskl, Dan is involved with product design. When speaking about the design process, he expressed that the part which he enjoyed most was not in fact seeing the finished product. Instead, he explained that the development stage and working out how the product design was going to overcome any potential issues was what he found most rewarding. He used a lovely phrase: ‘the story behind the way a particular piece is made is often as interesting and innovative as the way it looks’. I can’t help but think that the same is true of fashion. Yes, an Hermès handbag is beautiful in its own right, but surely the history of the brand and the skill of the craftsmanship behind it are just as important. Next Post Gone to Paris.. Happy belated birthday, Hannah! I hope you had a lovely day 🙂 And I have to say, this sounds fascinating; mainly I'd love to see an argument between Anna Wintour and Grace Coddington!